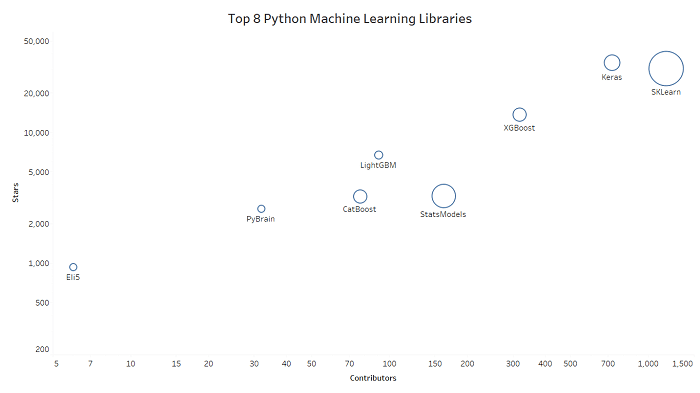 Part 1 of a new series investigating the top Python Libraries across Machine Learning, AI, Deep Learning and Data Science. Python continues to lead the way when it comes to Machine Learning, AI, Deep Learning and Data Science tasks. According to builtwith.com, 45% of technology companies prefer to use Python for implementing AI and Machine Learning. Top X Python AI Libraries – COMING SOON! Top X Python Deep Learning Libraries - COMING SOON! Top X Python Data Science Libraries – COMING SOON! Of course, these lists are entirely subjective as many libraries could easily place in multiple categories. For example, Keras is included in this list but TensorFlow has been omitted and features in the Deep Learning library collection instead. This is because Keras is more of an ‘end-user’ library like SKLearn, as opposed to TensorFlow which appeals more to researchers and Machine Learning engineer types. As always, please feel free to vent your frustrations/disagreements/annoyance in the comments section below! “scikit-learn is a Python module for machine learning built on NumPy, SciPy and matplotlib. It provides simple and efficient tools for data mining and data analysis. SKLearn is accessible to everybody and reusable in various contexts. Keep an eye out for the rest of this series which will be published over the next few weeks!